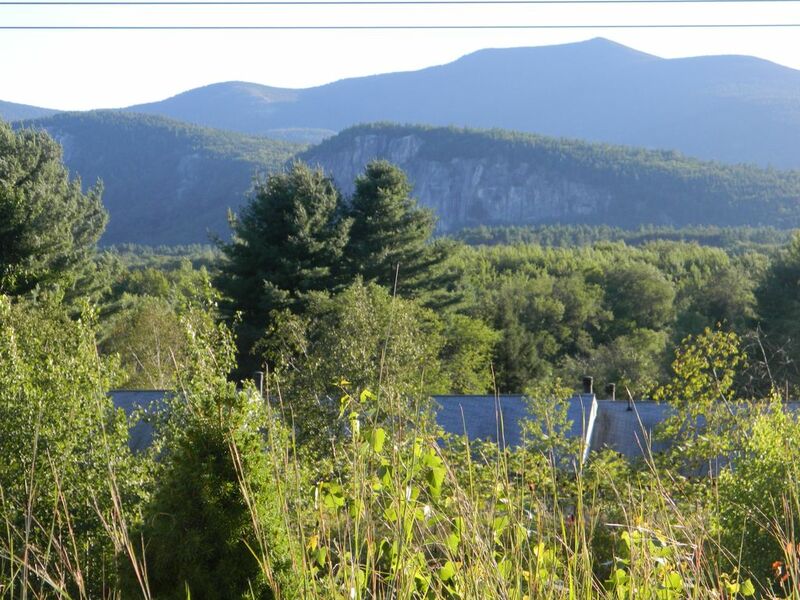 Panoramic Mountain Views in the heart of the White Mountains, in this charming North Conway/Bartlett Condo. The condo has the same views as the Scenic Lookout on Rt 16/16A, looking out at Cathedral Ledge and the Moats, the condo is very comfortable and has been renovated. Kitchen is modern with glass cabinets and corian counters and tile floor. There is a deck out back with wonderful sunsets, patio furniture, and also a gas grill for use. There is also a gas fireplace. This small condo development has only two buildings and is usually very quiet and private. The condo is two miles north of North Conway Village at the scenic lookout. There is a book with many local restaurants menus. The condo is handicap accessible with assistance, through back slider in months without snow. Bathroom door opens out for persons in a wheelchair. The pool is only open in summer months. Please leave condo as you found it when you arrived, cleaning service is an additonal $50. to renter. All linens and pillows are at the condo, you only need to supply sheets (queen) and pillowcases and towels. 1 queen, 1 sectional sofa with featherbed to put on top, can configure to full size or 2 seperate, very comfortable. Handicap accessible with assistance in all seasons except winter. Attractions nearby include Storyland, Heritage New Hampshire, Clarks Trading Post, Whalestail Park, outlet shopping, and many great restaurants also five ski resorts starting 2 miles from condo and all are within a half hour or less. There are also snowmobile trails, cross country skiing, right behind the condo, hiking, rock climbing on Cathedral Ledge which you can watch out on the deck. There is also kayaking, canoeing, fishing and waterfalls many within a couple of miles. There are also water slides, horseback riding, mini golf, biking, fishing and many more local attractions. Xmas week, school vacation, and long wkends are a 3 to 4 nt minimum. Rates vary from winter pricing depending on the amount of days booked. The pool is only open in summer months. Rates vary and start at: $80 - $150/night Property Owner prefers that travelers use echecks or mailed checks if time allows. For last minute rentals, credit cards accepted. Property Owner prefers to speak on the phone when making your reservation. Rates vary with seasons and are subject to change. $500.00 to $850.00, School vacation and Christmas week are 150.00 per night. . Discount for a full week stay.